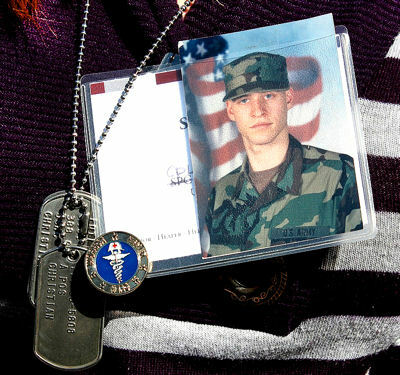 Sarah Fargo honors her brother's memory by wearing his photo and dog tags at a ceremony honoring fallen military medical personnel at Arlington National Cemetery in Arlington, Va., March 16, 2010. Army Cpl. Adam J. Fargo, a medic, was killed in Iraq in July 2006. WASHINGTON, March 17, 2010 – Army Cpl. Adam J. Fargo, a medic, was killed by a homemade bomb while on patrol in Iraq more than three years ago. But his memory was strong for his sister yesterday, who wore his dog tags and a picture of him in uniform draped around her neck. Fargo was one of the more than 300 people who gathered at Arlington National Cemetery yesterday for the Military Health System's 2010 Remembrance Ceremony dedicated to fallen military medical personnel. Set on a hill with a backdrop of white marble gravestones, the ceremony honored 244 medical servicemembers – medics, corpsmen, nurses and doctors -- who died in support of Operations Iraqi Freedom and Enduring Freedom from 2001 through Dec. 31, 2009. More than 100 of those in attendance were family and friends who came from around the nation and overseas to honor their loved ones. Countless people are alive, both in the United States and overseas, because of the courage and heroism of the servicemembers being honored at the ceremony, Rice said. “These great men and women paid the ultimate sacrifice to save their comrades and others,” he added. 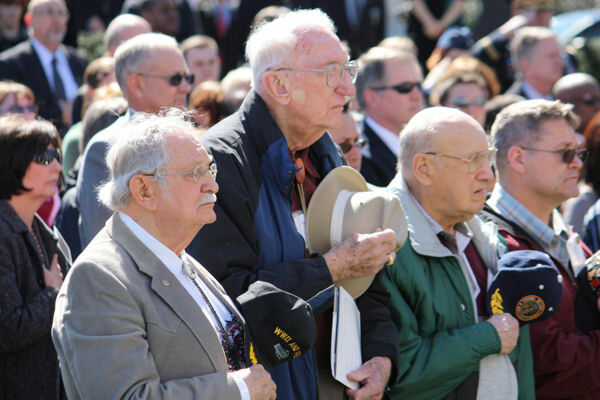 William Stecher, Ernest Dyson and Doug Fargo attend a ceremony in honor of fallen military medical personnel at Arlington National Cemetery in Arlington, Va., March 16, 2010. Stecher and Fargo's grandson, Army Cpl. Adam J. Fargo, a medic, was killed in Iraq in July 2006. Navy Rear Adm. (Dr.) David J. Smith, the Joint Staff surgeon, praised the nation's military medical personnel for their devotion to duty on the battlefield. Stephanie Walters and her daughter, 3-month-old Piper, attend a ceremony honoring fallen military medical personnel at Arlington National Cemetery in Arlington, Va., March 16, 2010. Walters' husband, Army Sgt. Richard Walters, a nurse, was killed in Iraq. “In the anguish of combat, when all the good seems so distant, it's the corpsman's compassion that provides a warm light of solace, refusing to yield to the ever-pressing darkness,” Smith said. “What can be said of a man or a woman who, when confronted with their own demise or injury, chooses to risk all to aid a fellow comrade? What greater act of love or devotion can one perform? Martha Raddatz, chief White House correspondent for ABC News; Navy Vice Adm. (Dr.) Adam M. Robinson, Navy surgeon general; and Army Maj. Gen. Deborah C. Wheeling, deputy surgeon general of the Army National Guard, also spoke at the ceremony. Following remarks, Gold Star members – an organization of those who have lost loved ones in combat -- helped to lay a ceremonial wreath in honor of the fallen servicemembers. Stephanie Walters drove from Ohio to attend the ceremony with her 3-month-old daughter, Piper, and her 18-month-old daughter, Rachel. Her husband, Army Sgt. Richard Walters, a nurse, was killed in Iraq while she was five-months pregnant with Piper. Walters sat through the ceremony clinging to her baby, her eyes lowered. The ceremony, she noted afterward, was a fitting tribute to his sacrifice.